Corrugated roofing is an industrial element that can be used in unexpected ways to create interior home decor. When you slide the silver 3-foot wide sections together, you can design a custom art piece to fit your space perfectly. Cover an entire wall, or just a small section, with a rusted, industrial looking piece that will be the perfect backdrop for a warm kitchen space, a teen's bedroom or an eclectic living room. 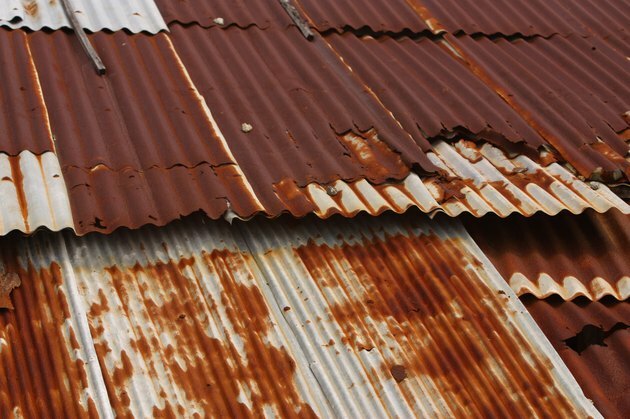 Rusty roofing may not look great outdoors, but planned rust can be a decorative element. Wash your metal corrugated roofing sheet clean of debris and dirt. Use an outdoor hose to power wash the metal. Dry it with rags, or allow the metal to air dry. 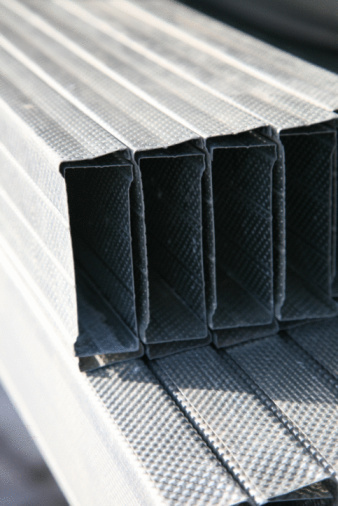 Slide sections of the roofing together to make the dimensions you need. Screw the sections together, and use a circular saw to cut the width or height (depending on the desired orientation) to fit. File down any sharp edges. Wear protective gloves and glasses for safety. Apply iron paint to the roofing with a large brush. Allow drips and uneven painting to create a more dramatic finished product. Cover one side of the roofing entirely, and apply multiple coats following product directions. Allow the iron paint to dry completely following the product directions. Depending on the exact product you use, drying time may be one hour up to 24 hours. Stand the roofing sheet up on its side in the direction that you intend to hang it. Place newspapers underneath it to protect the floor. Brush on the rust activator solution. Cover the entire surface thoroughly and then apply again from the top, allowing dripping and pooling from top to bottom. Allow the metal to dry overnight to give the rust time to develop. Apply additional coats of iron or rust activator to develop the degree and variety of rust on the piece. A desirable effect is to have a "waterfall" of rust from top to bottom. Spray the entire rusted surface of the roofing with a clear silicone sealant. Center the large sheet of corrugated roofing on a wall behind a kitchen table, over a sofa, in a hall or over a bed. Use black steel screws to attach the roofing to the wall.